This post was sponsored by Roadway but all opinions are entirely my own. Moving costs can really add up, especially when hiring a professional moving service to handle your move for you. So, why not save some money where you can? The following 10 simple moving hacks can help you save some money on your moving costs. Get estimates, in writing, from at least two licensed moving companies in your area. Many moving companies will send someone into your home to do an inventory and give you a free in-home estimate. Compare quotes and research company reviews on Angie's List and/or Yelp! Knowledge is power, and the more you know, the easier the decision will be to make. If you are in the New York City area, consider getting a quote from Roadway Moving. Roadway Moving is a top-rated New York City moving company with hundreds of glowing reviews. If your moving date is flexible, it may be best to avoid moving during the summer months. Summer is typically busy season for movers, and moving during off-season could save you a few bucks. This would be a good question to ask your professional moving company when planning your move. Moving companies typically charge based on how much stuff they have to move, so less stuff = less money. If you are moving yourself you will save money on gas with fewer trips and better mileage – not to mention saving time by having less items to pack and unpack. Go through your home room by room pulling any items that you no longer use, are outdated, or that you simply don't want to bring with you to your new home. Don't forget the attic and the basement! Separate items into a pile of items that you can get rid of and items that you don't want to bring to the new home, but aren't ready to get rid of yet. Items that you aren't ready to get rid of or won't fit in your new home can be placed in a storage facility. Sell high price tag and designer items using sites such as eBay or Craigslist. Use the money you earn to help fund your move. Yard sales are another great way to turn your junk into some quick cash. If you are planning a yard sale make sure that you take advantage of yard sale tips like posting your sale on Craigslist and using proper signage so that you will maximize your sale's exposure and get the most customers. Any items that do not sell you can donate to charity. Many organizations will even come to your house to pick up your unwanted belongings. Make sure you get a receipt for your donations so that you can claim the donation as a deduction on your taxes. If you will be packing your belongings yourself, be sure to save any cardboard boxes you come across in the weeks leading up to your move. Not all cardboard boxes are created equal so be certain to only save corrugated cardboard boxes. Corrugated cardboard boxes are much stronger than regular cardboard boxes and can support more weight. It is unlikely that you come across enough corrugated boxes to pack up all your belongings, so be sure to order high-quality moving boxes before your move to top off your stash. While using items you have around the house for wrapping delicate items might seem like a great idea at first, it might cause you to spend more money in the long run. If items aren't packed well they could be damaged during the move, and need to be replaced. Use bubble wrap, packing peanuts, and blankets to carefully wrap your belongings. You can likely order packing supplies such as bubble wrap and packing peanuts directly from your moving company. If your company is relocating or transferring you to another office, ask them for help paying for your relocation expenses. Employers will often help fund moves that they are asking their employees to make. Worst they can say is no. You may be eligible to deduct some of your moving expenses on your income taxes. Save all your receipts and consult your accountant or a tax specialist to see if you qualify. If you are in the New York City area, consider getting a quote from Roadway Moving. Roadway is a top-rated New York City moving company with hundreds of 5 star ratings on Yelp, Angie's List, and Facebook. These are very helpful tips. I got rid of a lot of stuff when we moved three years ago. It made things so much easier for us. I thinking packing carefully and asking your employer for help stood out the most to me. These are all great tips! I’m pinning and sharing this. I think I may have at one time or another used a combination of all ten of these moving tips. Ughhh I hate how much moving cost! Even if you’re moving local it still cost an arm and a leg! I absolutely loathe moving! I was so happy when we bought our home and I realized it would be the last time we will move for the foreseeable future. These tips will surely lessen the usual pain of moving for others! I purge like a mad woman when moving. I refuse to take so much stuff with me that I don’t need. This moving tips and ideas are really useful specially of my situation i’m not really good in organizing item in a box so that moving is my really big problem its really stressful so much but for now i don’t need to move for now but i will take a note for this great suggestion in case might change. Thank you so much guys for sharing. I like you 5th one “Have a yard sale” tip. It is not only going to save money, but you’ll have fewer items to move. It should be done several weeks in advance. Donate whatever remains to get it out of your hair. Just be sure to give helpers first dibs on the items up for grabs. I agree that moving involves a lot of work and its equally a work of excitement. But if we don’t organize it properly so that it’s not a mess at all. You have mentioned great points over here. Worth reading post. Loved it. Your tips are the ultimate guide for me. I will definitely use them for our upcoming move next month. Thanks for the amazing post. I’m bookmarking it right away and coming back when I most need it for a closer inspection. I will definitely share it with my friends as well. THANK YOU! 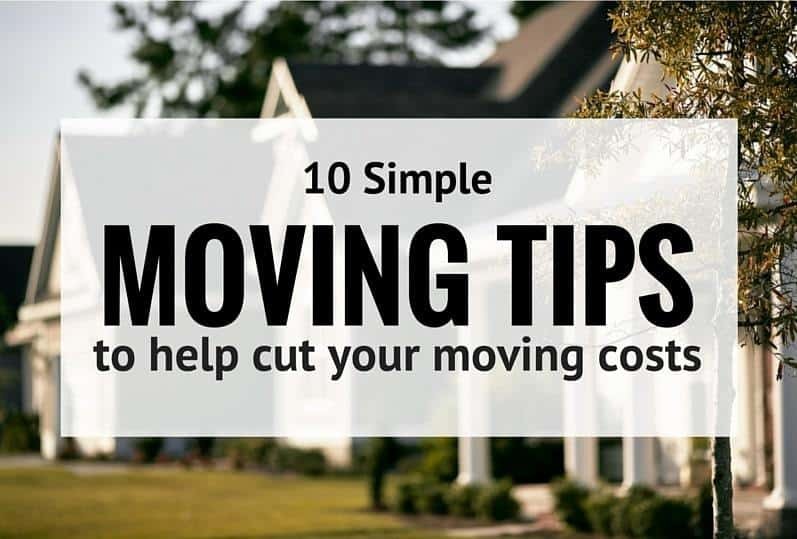 This 10 are not just simple steps but they are amazing steps for moving costs and moving ideas. Thank you for sharing this impressive ideas.